An extremely wet day that saw the PW Team journeying to the Bournebrook Avenue area south of Gorsey Bank to correct track alignment which had been affected by the recent very high temperatures. The SBT reported that they had achieved 60 ft of stonework and 60ft of concrete backfill over the last two days. At base repairs were conducted to the fire damaged cable supplying power to the north end of the Maintenance Facility and the LCC gave the locomotive hauled set of carriages a good clean. The Filing Fairy continued to ensure our records are in good shape and Mike Evans made progress with renewing the yellow end of 51188. Sales were made in both the Booking Hall and Pullman Buffet Car as we look forward to tomorrow's threatened heat wave. Today's photo is another from our not too recent past as the Idridgehay Level Crossing was remade before that section of line was reopened. PS - Those needing access to the Wirksworth site in the early hours for steam locomotive purposes should note that these combination locks have not been changed. A quite delightful day as it was necessary to strengthen the Duffield service to cope with demand including a short notice coach group from Duffield to Wirksworth. With the aid of the dmu team the Class 108 was attached in short order to the Bubble Car and demand was met. Iris was restored to health and worked the later Ravenstor services of the day. Great credit, as ever, to the train crew, Booking Halls, EVRA shop and Pullman Buffet Car for ensuring all today's passengers had a pleasant and memorable experience. The Booking Hall at Wirksworth also had many successes with forward bookings and hoovered up a most satisfactory amount of money during the day demonstrating the value of being able to accept currency in any form presented. The DST conducted tests with Henry Ellison after further attention to its bearings and much work was achieved with Cathryn's boiler. Richard P gave the Yard and north thereof a further burst of weed treatment and Mick K left his carriage restoration work for a while to coal 52322 and present another few lumps for Friday's driver experiences. Nathan struggle with the deteriorating step into the Extra Ladies and the LMSCA made further inroads to the reglazing of the Third Open together with more housekeeping on the Brake Third Open. The M1M were in evidence on their SK. 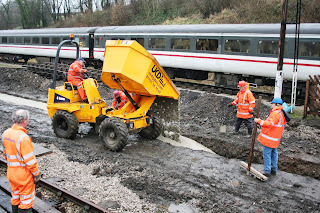 Today's photo is another reminder of the recent past being taken on the 3rd March 2007 as construction of Platform 2 was underway. A reminder how far we have come in a very short time. A very pleasant day temp wise but lots of shunting to release Breeze and the engineers brake van which after several operating days had become cocooned amongst several thousand operating dept vehicles- or so it seemed. By the way because it is thought that the combination to the various locks around the site has become too common knowledge the number has been changed so if you have trouble with unlocking things check with the RO that the number is the correct one. It is thought that the robbing of a world war two enigma machine from the local second hand shop has enabled the resident yobbery to crack the lock code. P Way had the works train to Shottle shunting around the engineers vehicles and dropping ballast at footpath F3 with several broken base plates changed and a joint sleeper replaced at Green Grass's took up the rest of the day. VCT has been cutting more trees at Jebbs Lane with 2 fires and more of the team has been at Hazelwood constructing a shed from the remains of the old p way hut at the station. A day of sunshine and brief torrential showers saw us steadily up and down the line with the passenger service, having first overcome the effects of the overnight weather on the lineside trees, one of which wasn't so much on the lineside and as on the line. Nevertheless we ran to time after the morning's Find a Bowsaw Challenge resulted in the Passenger Department's Emergency Response Clio being despatched to Jebbs Lane and a number of other lanes in the Shottle Triangle. ready for its receiving a new yellow end. The Duty Conscript, who has been with us several weeks, during which time he has gained an intimate knowledge of the strimmer, occupied himself and his close personal friend around the narrow gauge. Meanwhile the Duty Manager having discovered that the weeds at Cemetery Lane were so high that a small elephant could be lost in them for days at a time, gathered an assistant and proceed to indulge in the annual Cemetery Lane Festival of Weed Pulling. I would like to thank Jonathan for his help and a small lost elephant will shortly be returned to its owner. Another lovely day on Derbyshires friendly railway as we started the second week of the L & Y locomotives visit to our railway. A steady stream of passengers enjoyed the journey down the line including the visiting Stanier locomotive group. Anton and a party of cadets went to Shottle to make more headway on the access path. The DMU group made final plans for the dmus multiple memories weekend before they enjoyed a trip down to Duffield. Another good day my thanks go out to all the staff who made it a perfect and enjoyable day. A pleasant day of pottering around with our steam experience guests and general tidying up ready for the weekend. 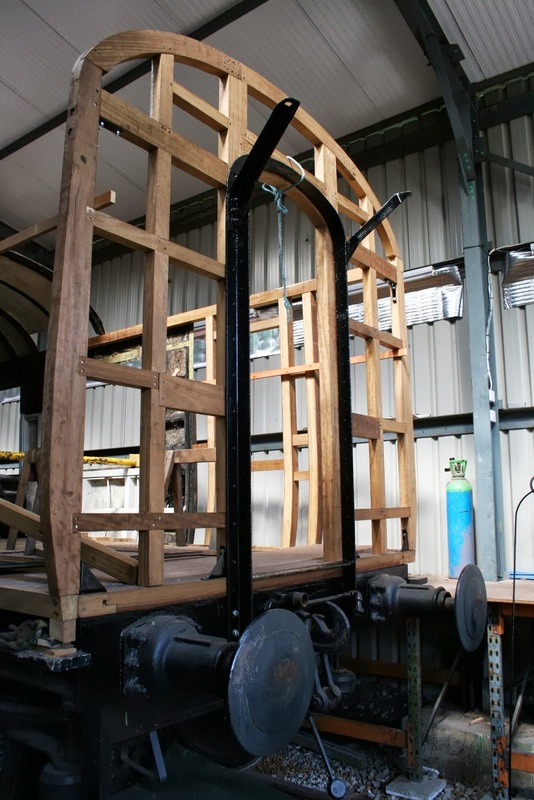 The saloon received some careful varnishing to its interior door panelling and the Station Foremen dealt with the usual Friday selection of choice maintenance tasks including step repairs for the buffet and the removal of the collapsed gate on the school path. Down the yard, the DMU team applied a white gel coat to the front end dome of the class 108 and then retired to the Mess Room for a computer consultation. staff, I understand. If you know of anyone who may assist them please contact the Heritage Centre directly. After a dull start to the day I thought our first Thursday service of the season was doomed to a miserable performance. How wrong was I as the passengers descended in good numbers and it was nice to welcome some old friends from the West Somerset Railway who wanted to sample the Royal Saloon. A most satisfactory day with many thanks to the train crew, Royal Saloon Steward, Booking Halls, EVRA shop and Pullman Buffet Car with particular contribution by Eric Hills who manned the Gorsey Bank gates to keep the services to time. In amongst our main activity the track was patrolled between Shottle and Ravenstor and the small PWT screwed down the southern turnout of the Shottle loop. The LMSCA made further strides with the Third Open and one senses that the second restoration will be even better than the first. The M1M gave their SK more attention as this vehicle is accelerated back into revenue earning service after a break of some 30 years or more. Determination is a great thing and project that may otherwise drift on are not allowed to at Wirksworth! The VCT were not able to move far from Hazelwood but managed a single fire and some refurbishment of the lone, relatively, complete Permanent Way hut that will be a feature, I am told. The dmu team tended to the cylinder head problems on Iris and got incredibly dirty but it reflects great credit on the technical skills of the group as life is breathed back into these ancient AEC engines. A photo tries to demonstrate this. A grainy photo is attached of our very own Reverend who was press ganged into some washing up and seemed to need to expose his legs after the exercise. The Lord moves in mysterious ways. The gods were with us on this very special share holders day and my thanks go to everyone who made it work, the train crew, Booking Hall, Pullman Buffet Car, EVRA shop, Narrow Gauge, Mininiature Railway, Class 119 team, preparers of the Car Park loco display, LMSCA and our guides for the Yard tours. Tom gave presentations in the Training Room throughout the event and the LCC played a starring role in running the Share Stall. Our visiting engine provided footplate experiences which were well received with two of the participants shown. Too much enjoyment! The whole event was an unqualified success and I do hope those that put so much money into our enterprise enjoyed their time with us. I am also very grateful to all who put their hands in their pocket to increase the capital base of the Company after a not so subtle appeal for more money. Working away from the limelight at Shottle resulted a further 30ft of wall laid and a track inspection between Duffield and Shottle completed. Hydraulic oil was delivered to Shottle for John Rowland who put some in the dumper at Hazelwood to check for leaks. He has sorted out the electrics and the machine now starts first time. Another leap forward. The Filing Fairy quietly continued with her tasks as the day progress. A day of storms, some of which were quite violent, that undoubtedly depressed the number of visitors today. Nonetheless the team of train crew, Booking Halls, EVRA shop and Pullman Buffet Car did their best to raise funds. A slight lift was a pleasant surprise visit from the Cornish Railway Society who joined the 1510 from Duffield for a quick look at our line as part of a week's bash of heritage railways in the Midlands. I can't miss the opportunity to thank everyone who participated in making the Classic Vehicle weekend a success with a particular mention of Geoff & Sue Clark who masterminded the event to our benefit. The whole thing requires a great deal of effort and is quite tiring from narrow gauge, parking and marshalling, No3 driver experiences, the service trains of both dmu and steam, Booking Halls, Pullman Catering, EVRA shop, Gorsey Bank gatekeepers. 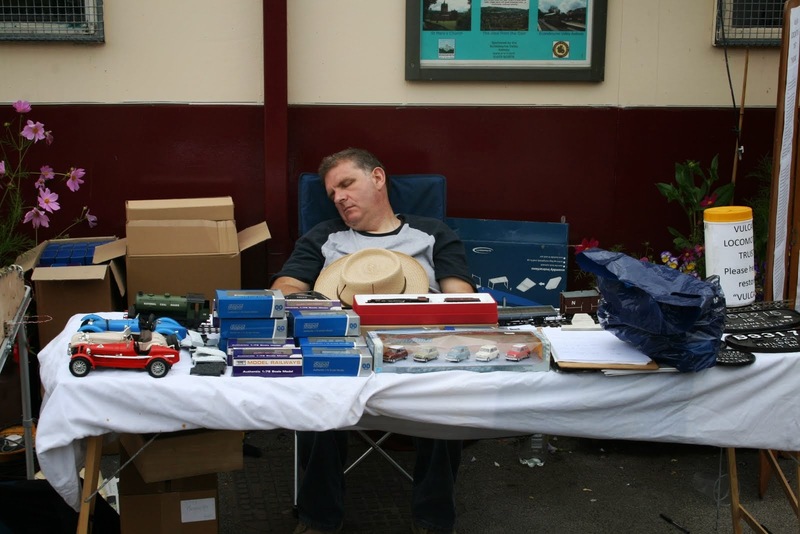 Royal Saloon stewards and stall holders both active and passive. A very great effort! Back to today where the LCC delivered her magic on the locomotive hauled set and Training Room. She requested up titling in view of her marketing success with No3 and this has been referred to the "Title Sub Committee" for consideration. 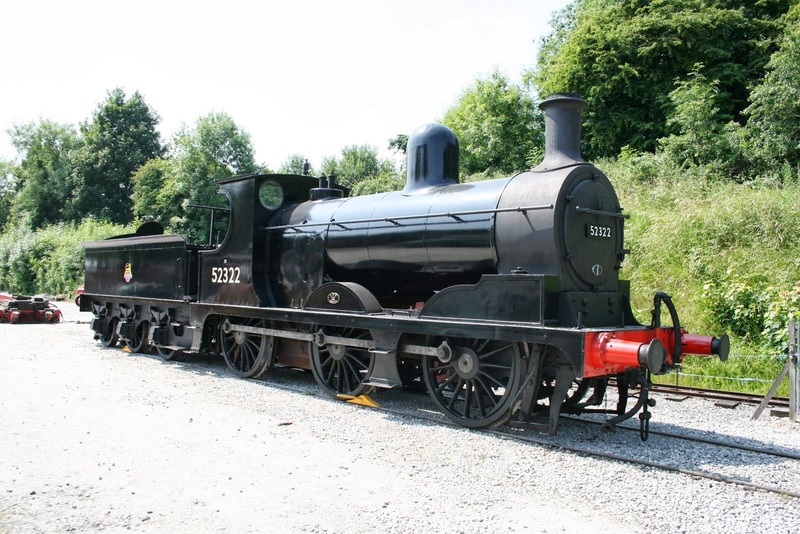 The DST concentrated on preparing No3 for its next driver experience day and returned Henry Ellison to ground level after further attention to its bearings. The LMSCA were out in force to address window drains on the BTO, glazing and bodywork progress on the TO together with cleaning and painting the roof hoops. A start as been made on the final filler to enable the TO to be repainted. Special thanks to Allison who has cleansed the BTO so that it can take its part in tomorrow's Share Holders Day. Reports have been received of further progress by the SBT and more strides in determining another access to Shottle if our protracted negotiations with our neighbours fail. The dmu team continued sprucing up the fleet for the Multiple Memories weekend, placed the Class 119 in position for tomorrow and orchestrated a display of locomotives in the Car Park, again for tomorrow. 52322 was also in receipt of treatment to enable it to haul tomorrow's trains and Iris had further work to repair the engine head problems. Owing to all the activity today I haven't been able to take a topical photo but then attached may intrigue. The way it was! Progress Mon 22nd July 2013. Another sweltering day here at Wirksworth with the temp at 31 degrees C.
We played host to Nifty Lift, one of our test customers who were pleased to have 2 machines past their 1530 test today- we are also pleased as its more dosh in the bank. Breeze was run to Shottle amongst the testing work to shunt the van into a more convenient place for work later in the week as it had been deposited in the up siding on Friday and the timber for Wirksworth platform steps recovered. VCT cut down 4 big trees that were causing offence to our rolling stock but had no fires today. A lone LMSCA worker attended to jobs on the LMS 3rd open. The buffet had a few customers along with the Nifty Lift blokes. A very successful Classic Transport Event saw us cooled by gentle cloud making today both pleasant and enjoyable. We were delightfully busy but not overwhelmed and there were a great many things to see and do both for our regulars and for new visitors as well. Many thanks to everyone involved in the preparation and running of this event in any way. A cool summers day greeted us as we arrived very early to get the Classic Car & Transport weekend underway here on Derbyshires friendly railway. The 08.20 to Duffield used Bubble car 55006 after the 3 car unit decided it wasnt going to start ( soon rectified by Ollie and the gang ).but was soon in service on the 10.20. 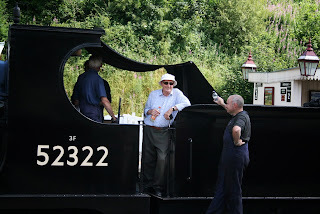 The L & Y showed its self off proudly to the public as it trundled up and down with the 12.20 14.20 16.20 services manned by Andy, Matt and Tom who looked like they had just done a shift down the coal mines. 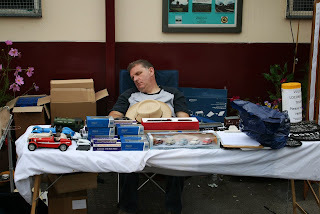 The booking offices were kept busy with the steady stream of passengers for the steam locomotive inc No3 driving experience which was encouraged by the new tannoy announcer here in Wirksworth who even managed to wake up the occasional sleeping stall holder here on platform Ome. The pullman buffet was kept very busy until 3pm when all eyes were on the Battle of Britians memorial flights Dakota as it again flew down low over the railway Our thanks must go out to the Raf BoB crew and to Geoff for organising it. Well done guys . The Classic cars . motorbikes and lorries were also appreciated by our visitors our thanks go to Geoff , Liegh and the gang for this wonderful display. Ps sorry for last weeks report failing to publish Im led to believe its still somewhere in Cyber space. My thanks go all the team who actively participated in one of the most significant weekends of the year. The public responded to all the enthusiasm and expertise displayed. John will be sending his take on the day but I thought I would share with you the sheer alertness needed by stall holders to maximise their sales together with a rather poor attempt to capture today's Dakota fly over on what turned our to be a dull, warm day. undertook a successful gauging run to Duffield and back, and this was followed by the class 31 delivering two wagons to Shottle sidings. 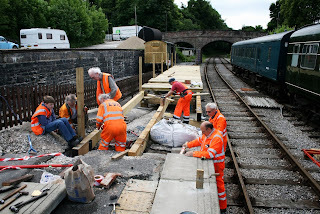 Preparations for the weekend's Classic Transport Gala occupied the Station Staff at Wirksworth including the repair of platform 3 coping stones, pothole filling, general tidying up and the routine inspection of Ravenstor Station and its environs. In the platform the Saloon had its roof attended to and at Duffield efforts were made to cut back an excess of vegetation near Holloway Road and deal with weeds and rampaging moss on the lawn, with temperatures of 34 degrees recorded in the charming (insulated) metal shedlet which is Duffield Booking Hall and 39 degrees in John Rhead's car. Another successful hosting of the RAIB on a training day as they concentrated on an area around the Wash Green Ground Frame and indulged some movements of 52322 as it took water for tomorrow's tests. The PWT which, in addition to looking after the RAIB, consisted of one and a half members that struggled manfully to complete the Midland Railway fencing on the Wirksworth platform extension. Three cheers for James, on work experience, who supported Mick. Nobody else was seen! The M1M tended to their SK and the Royal Saloon with much work on the compartment ceilings of the SK and coach corridor. The Saloon had a roof wash so that at a very early hour Terry can apply further sealant tomorrow. Ted, the welder, inserted some 15 sections of steel in the SK to restore its crash worthiness. Quite an achievement and a credit to his skills. The small PWT attended to the fence and a photo of their achievements is attached. The VCT were attacking an area south of Shottle with much cutting and burning. 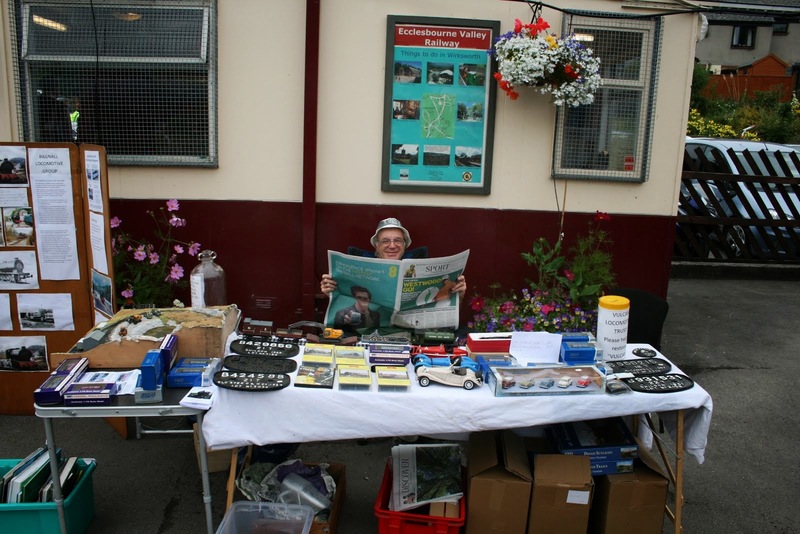 The Pullman Buffet Car and Booking Hall welcomed a number of visitors and there were more advance sales of experience days. 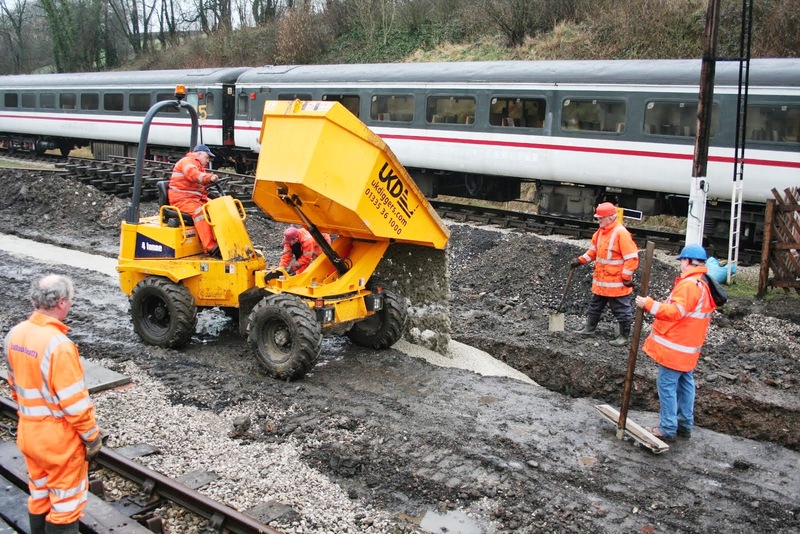 A final reminder that the next seven weeks will be a make or break for our Railway. Please help in any area if you possibly can as there will be plenty of time for rest over the winter - probably 5 months! Well it's arrived! Allelys arrived mid morning with their customary efficiency and dropped off the two parts of 52322 which will allow it to be put together tomorrow and I am grateful to Bob Gibbens who conducted the delivery inspection report. We hosted Relate Derby & South Derbyshire for a meeting that moved from one side of the shelter on Platform 2 to Platform 3 as the sun moved round. Lunch was provided in the Pullman and the participants were suitably impressed by all the movements being carried out as we prepare for the upcoming weekend. 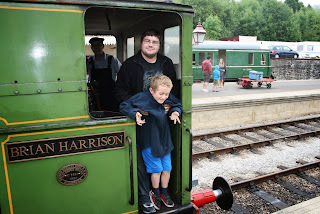 Rob and Ollie did a sterling job, after the Works Train arrived back from Duffield, by performing all the necessary shunting, not easy in the sweltering heat. Iris was found to have a cylinder head gasket failure and a start was made to prepare for replacement of the offending part. The PWT concentrated on the Midland Railway style fencing for the Platform 2 extension at Wirksworth and the LCC, after a marketing spurt, tended to the locomotive hauled set and agreed to a number of extra tasks at the weekend and next Wednesday. The Booking Hall made several experience sales to swell the coffers and the Pullman Buffet Car received a steady and encouraging trade. Firstly may I thank everyone who participated in the re-timbering of the Duffield footbridge and returned it to use today, one day in advance of the formal closure notice expiry. This task had many firsts for us and is yet another magnificent demonstration of the team pulling together when a challenge is set. Well done! 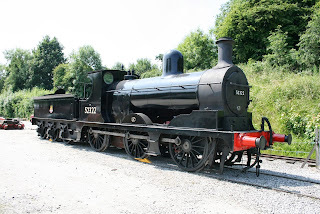 Yesterday I paid the final £22,000 of the ten year loan that enabled us to purchase the Railway with the great help of an anonymous supporter who had asked for no security and trusted us to deliver a working enterprise. His trust has now been repaid but, as you may imagine, the coffers are now bare and need the next seven weeks to be magnificent to see us through the long winter months. Today, the dmu team concentrated on the cosmetics of the Class 119 and most things were polished. Fred & Iris gave a welcome clean of the Mess Hall and as no-one brought any milk with them today tea and coffee was taken black! The LMSCA had a busy day with the TO quarter lights made ready to refit, an hydraulic press was installed to enable the bushes of brake rigging to be renewed and through cables were fitted to the BTO to enable it to talk electrically to the TO. The DST are quite concerned about overheating bearings on both operational locomotives and continued to search for a solution. No3 was prepared for a role this coming weekend. The M1M beavered away at their SK and assisted with the repairs necessary to the toilet in the centre car of the 3 Car dmu set. The service operated to good effect with the Pullman Buffet Car, Booking Halls and EVRA shop all benefiting for today's visitors. I am extremely grateful to James Gould, on work experience and a cadet, together with Nathan for stepping into the third man's role after the rostered person absented himself from today's services. As ever, no trains, no money, no enterprise! Progress Mon 15th July 2013. 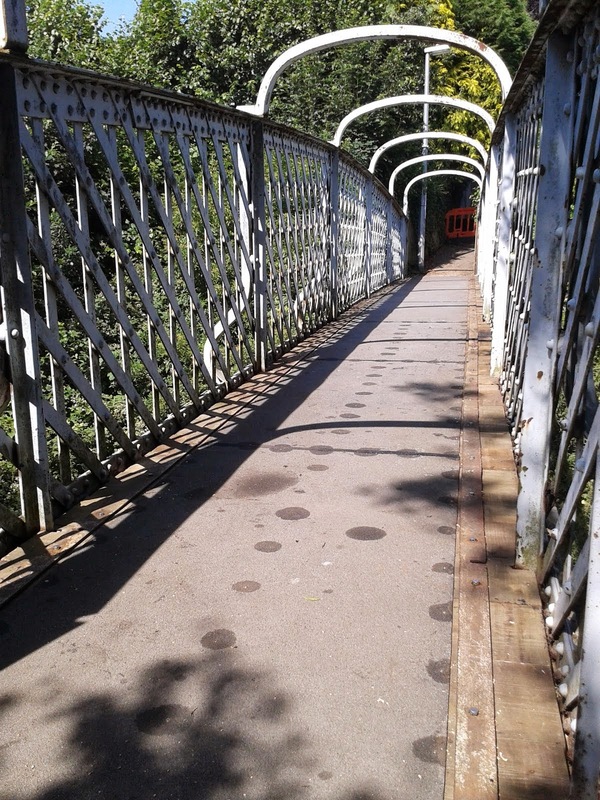 Todays report comes direct from the jungles of Duffield where regular treatment of the standing water to eradicate biting insects has kept the incidence of yellow fever amongst the bridge repairers to a mininmum. The valiant effort of the team today has 95% of the work complete with just 2 boards, 1 step, the metal containment strips and the fibreglass anti slip panels to install. The work will be complete tomorrow which is 24 hours before the closure expires. An excellent effort by the team which has saved the company several thousand pounds. Timber lats for Wirksworth platform extension fencing has arrived today so hopefully work can proceed later in the week. Many operating dept bodies were present to run the 10.30 am charter to Idridgehay and back with some driver training thrown in as well. Lone LMSCA worker has been busy along with Joe to assist and was nobbled on his way out into revealing that electric cables have been installed underneath the LMS brake under restoration. Rodney has been around at Duffield doing what Rodney does. The Komatsu has also been extricated from the maintenance shed and moved to the loading dock ready for coaling the L and Y loco on Wed/Thurs. We boiled gently in the heat and watched our Steam Experience guests gasp past on Henry Ellison. 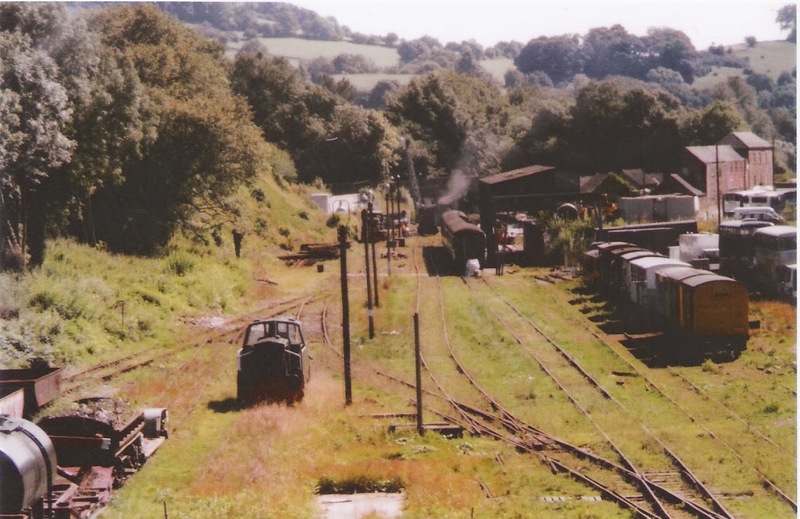 Down the yard, in a shady spot, the class 31began to receive paint to its lesser photographed side. The Station Foremen engaged themselves in grass mowing, hedge cutting, weedkilling and hole filling both at Wirksworth and at Duffield, and at Shottle we progressed the ramp access further up the bank, and moved a number of "donations" which our neighbours have kindly deposited on railway land to save themselves the trouble of visiting Raynesway Recycling Depot. The bridge project at Duffield saw a much smaller turn out that slowed progress to our objective of completing by next Wednesday that is the end of the formal closure. This does mean that next Monday, Tuesday and probably Wednesday will have to be devoted to these repairs. My thanks go to today's team that had to overcome yet more surprises on this aged structure. Back at base John Allsop varnished the Second Open of our Pullman set and the coach gleamed in the warm sunshine. It is a process that gives extra life to the livery and is well worth the effort. The dmu team continued with servicing our fleet and completing various embellishments to the recently restored Class 119 as they head towards the Multiple Memories weekend.The LMSCA were also in go mode with the Third Open but were seen to lunch in the warmth under the passenger shelter on Platform 2 without a care in the World. The VCT returned to their fencing work north of Idridgehay, another unheralded task as they care for our 18 miles of boundaries. The M1M made strides with the SK and the interior panelling of the Royal Saloon. Half of the roof of the Saloon has had yet more sealant applied as we try and bottom the water ingress to the vehicle. I omitted Dorothy's contribution from yesterday's report as she valiantly tries to keep on top of the floral displays at Wirksworth and Duffield. Another unsung hero as who couldn't be appreciative of the displays at both stations - they don't appear by magic. The Pullman Buffet Car benefited from a steady passing trade and the Booking Hall hovered money from future customers. Yesterday's Santa planning meeting seems to have been extremely productive allowing for further expansion of this vital earner. All in all, a most pleasant on productive day. 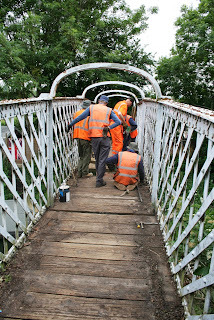 The great project today was to restore our reputation with the good people of Duffield as we started to repair the timbers of the Duffield footbridge. As ever life presents unforeseen problems as the plain timber baulks could not cope with the unseen rivets that would not enable the new timber to seat well. The combined forces of the PWT and Asset Manager devised a way forward that dealt with the problem but extended the time each of the 59 new sections could be inserted. 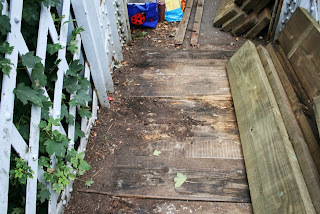 Three photos illustrate some of the energy being put into this job and the condition of an area of woodwork. Many thanks, as ever, to all who participated today. Further work will be undertaken tomorrow and any contribution to the labour force would be welcome. Back at base the children's play area received more tlc and the Bubble Car was washed. A meeting was held to determine the shape of this year's Santa programme and great thanks are due to John Ball who has checked and serviced all our first aid boxes that now total an amazing 31. The LCC, a good mother, has cleansed the 3 Car set and the Filing Fairy has spent a full day regularising our records. The Booking Hall continued to swell the coffers and there was a steady stream of customers for the Pullman Buffet Car. 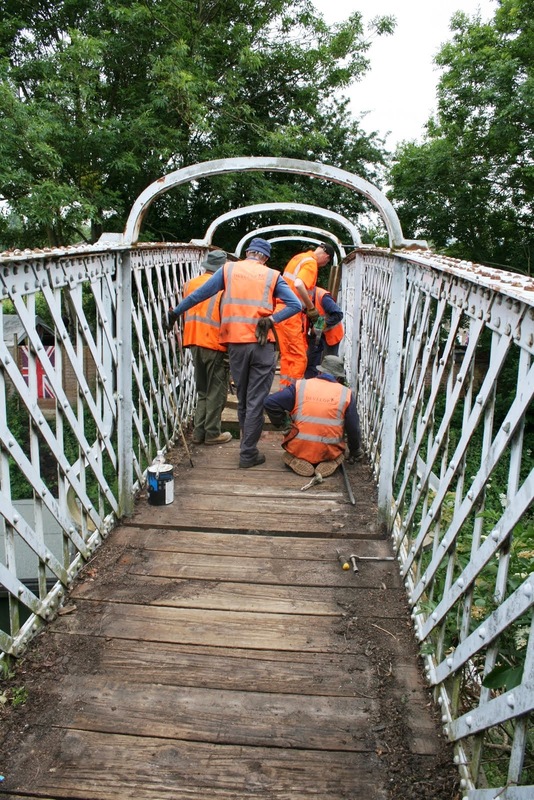 Temperatures have cooled somewhat which aided the heavy work associated with the bridge repairs. Many thanks for another enjoyable weekend at you railway. Will you please pass on our thanks to Geoff and Sue Clark for making the event a success. Firstly I must add my voice to the peons of praise for Geoff Clark and everyone who made the Classic Bus Weekend such an outstanding success. The atmosphere was extremely good and had something of the feel of a carnival. A great deal of hard work was involved at the event itself and all the pre-planning that went on for months behind the scenes. Geoff's inspirational contact with the Battle of Britain flight created our first ever air display - wonderful! Today also basked in the most unseasonable weather resulting in more success in the Booking Halls, EVRA Shop and Pullman Buffet Car - its quite a pleasant feeling that we are earning more than we spend at long last. The train crew played their part over quite a long day and I am grateful to them. 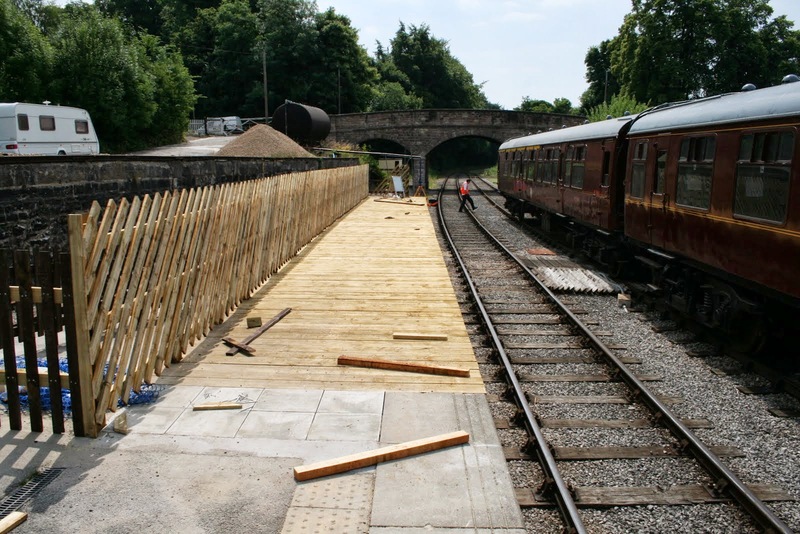 The PWT drew the platform extension to a conclusion at Wirksworth whilst only awaiting the timber for the Midland Railway style fence - their efforts are illustrated. 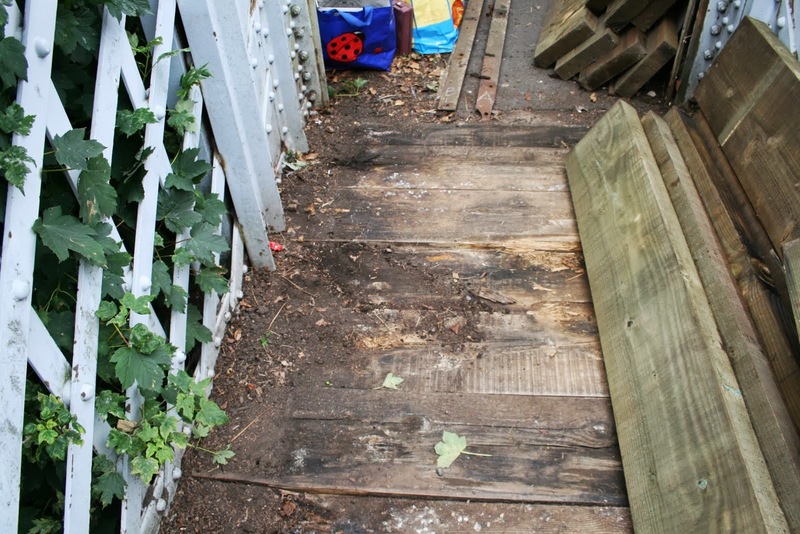 There was a very welcome general tidy and maintenance of the children's play area which forms an important part of our efforts to retain passengers on site after a train ride. The DST prepped No3 for its driver experience role on Friday and returned to the vexed question of overheating bearings on Henry Ellison. Cathryn had much toil and ever more sweat to deal with its front tube plates. The Asset Manager and PW Foreman made further inroads to underbridge measurements. This, again, is behind the scenes work as we seek to evidence that the structures are fit for our trains to run over and we have been much aided by "friends" from Bob's previous life. Nathan was pressed into more fence painting at Wirksworth and had a very generous surprise from the LCC. What a wonderful mother. Dmu maintenance concentrated on the Class 119 with its launch day fast approaching. Fred & Iris were heartily welcomed as they gave the Mess Hall yet another good do. 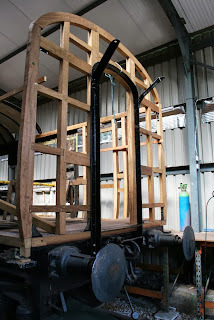 The LMSCA mad great strides with the fitting of the southern gangway connection on the TO and completed the refurbishing of the sliding windows for the vehicle. We intend to use the BTO as an illustration of the restoration work undertaken at the share holders day event and John & Allison have completed tidying the interior so that it can double up as a presentation venue during the day. Over the weekend a magic part of our internet and till system gave up to the extreme heat and I am extremely grateful to Zycomm who loaned us a replacement and David who rushed off to Ripley to collect it. The horror of having no till was to much to bear. The Works Train was assembled for a quick getaway in the morning as we tackle the Duffield footbridge task. The sun induces a feeling of wellbeing that was felt in all departments - I think. Progress Mon 8th July 2013. 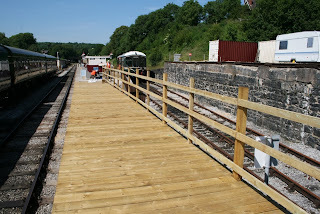 A bit warm today for mixing concrete and shovelling but work continues on Wirksworth platform with the surface now complete and steps and fencing left to complete. Timber has been delivered today for the major repair to Duffield footbridge more of which later in the week. VCT carried on with fencing work at F5 crossing North of Idridgehay in addition to having a fire to keep warm and cutting further trees. 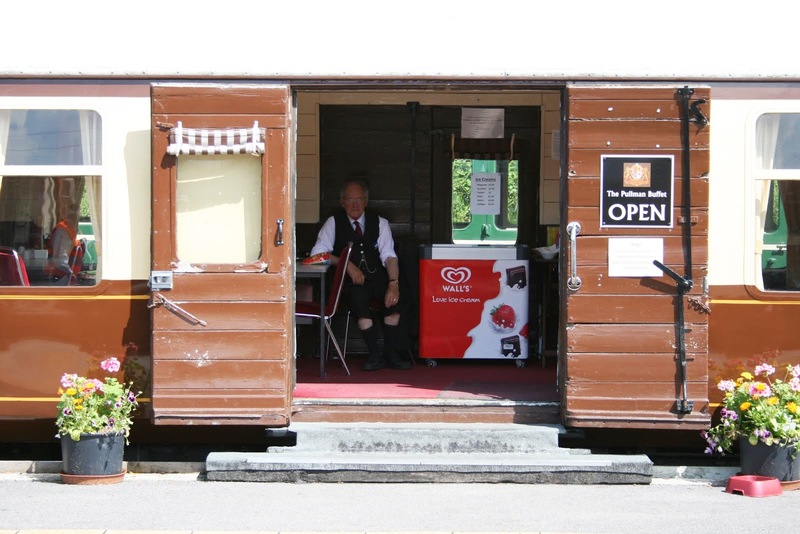 Booking office and buffet had a steady throughput of visitors with p way partaking of the ice creams on offer. A lone weed killer continued with dealing with the rampant weed growth in Wirksworth yard. LMSCA had a lone presence today but as to what they were doing is known only to God and the blowing wind. 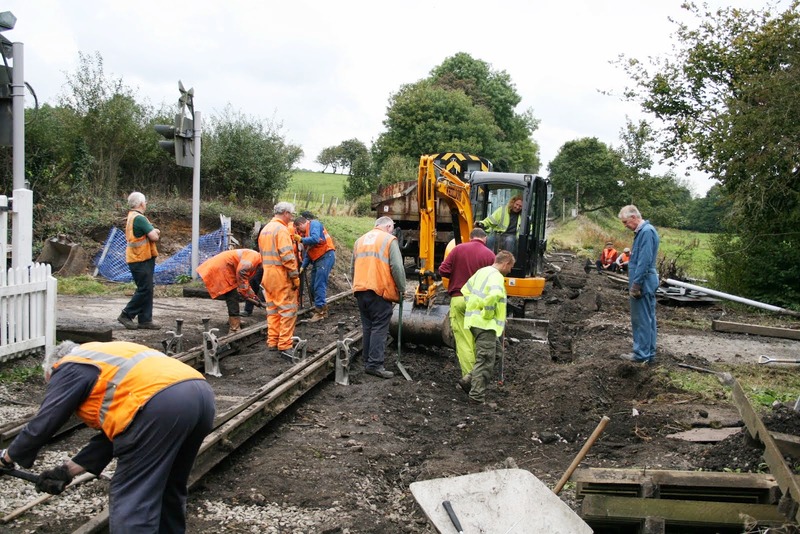 Rod Mary were on site dealing with jobs on the narrow gauge railway. A very hot day- roll on winter. 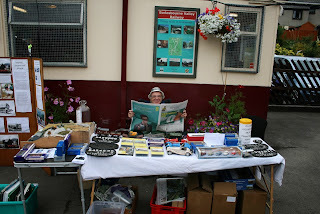 I write this evening to thank everyone involved in this weekend's Bus Gala, and in particular our chief organiser, Geoff Clark, for a magnificent event, including a whole range of activities from the railcar and steam services, to our participant bus and coach exhibitors and operators, and to the Battle of Britain Flight for their wonderful flypasts. 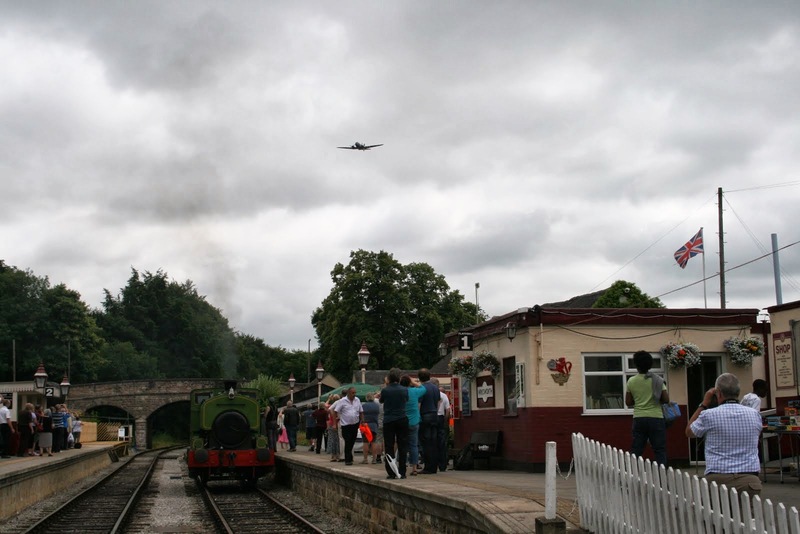 Virtually every part of the railway, large and small, over the weekend and in a range of effort in its preparation, have been involved and it has been a considerable success. A lovely hot summer day here in Wirksworth with the birds singing in the trees, the steamer chuffing up and down with experience guests and the sound of the ice cream fridge door being repeatedly opened in the buffet car. found that the narrow gauge area was free of JCB wreckage (sorry, weights); the car park markings being renewed; and the Pullman being varnished to a level of shine in which one could part ones hair as if it were a mirror. In the midst of all this the steamer and its crew recovered the weltrol or possibly the flatrol or maybe the lowmac, from Shottle, assisted by a slightly baffled placement student. Ballast Dock tomorrow and Sunday, as the car park will be full of BUSES. The heat is rising which always induces a feeling of wellbeing. The team achieved more flailing between Shottle and Duffield and much shunting and positioning of stock for the coming Classic Bus Weekend. Great strides were made with the Wirksworth platform extension - as ever the quality of work is of epic proportions and reflect great credit on all the team involved. The dmu team were very active as they prepared the stock for the weekend, pressure washed everything in sight as they lead up to the Multiple Memories Weekend. If any of you have seen the advertising there are some various dubious characters involved - I used to be a fan of Abba. The VCT quietly did their thing north of Idridgehay repairing fences and creating a lot of heat with a large, elongated, fire. The M1M reported that many minor tasks were concluded within the SK including much swapping of seats and the CK received yet more attention - I'm sure they are going for an award. The Booking Hall continued its quest for more revenue and the Pullman Buffet Car tended to today's speculative visitors. From yesterday the PWT reported a further six sleepers changed with only one left to do in the current year's replacement programme. PS - we are trying something completely different next week - the replacement of all the timbers on our Duffield footbridge north of the tunnel. This is all scheduled for next Wednesday with a contingency on Thursday. We have never, ever, done anything like this before and all hands are welcome. It is a reminder that running trains is dependent on the infrastructure - however, we are next door to Rupert Brennan-Brown who will be out every 15 minutes with appropriate refreshments I am sure. Amazing progress with the Wirksworth platform extension is illustrated showing the team and this week's work experience participant, Ashley, who is holding the post in position. The LCC cleansed the Training Room and 3 Car set ready for the up coming weekend where we hope to capitalise on the classic buses attending. Hitherto this has been one of our best weekend's of the year. The M1M quietly continued to varnish the interior of the CK and the Pullman Buffet Car tended to Norfolk Dave's walkers. The Booking Hall continued to receive advance bookings from on line reservations. There are one or two omissions and clarifications with an overdue thank you top Tony as he treated the yard and Incline with weed killer on Monday, The LMSCA had a busy day yesterday with more structural timber installed at the south end of the vehicle and continued sanding back to bare metal. The mystery of hot water emerging from the cold taps in the Mess Hall was solved by David. Unfortunately we haven't discovered a secret geyser, just a stop tap turned off by an unthinking participant of our enterprise. A little knowledge etc. etc. Another unsung team from yesterday were the track patrol team that ensure we can trundle up and down the line with confidence. 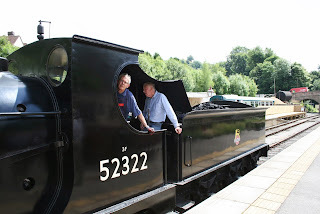 As ever, a great team on site today with the DST resolving a number of tasks that ensures we have two steam locomotives available for service and driver experience days acknowledging the help received from the 8F team over the past weekend. The steam experience bookings continue to grow so that all the work results in satisfactory income for both the Company and EVRA. The dmu team, after they had helped prepare today's service vehicles, concentrated their efforts on the Class 108 to restore the drivers desk unit and ensured the jumper cables facilitated communication with the rest of the fleet declaring the car fit for service. Fred & Iris gave the Mess Hall their customary cleanse and ensured the area around our station buildings at Wirksworth looked tidy. I remain ever baffled by peoples inability to wash their "pots", not difficult or emasculating, but evidence of idleness I fear! Today's service ran well and brought in a satisfactory income and my thanks go to the train crews, Booking Halls and Pullman Buffet Car. The LMSCA saw further timber added to the south end of the Third Open as the coach gradually comes together again. Further sanding of the exterior will allow a fine paintwork finish to be achieved. The SBT quietly faced the foundations of the platform achieving some 30 to 40 metres and the Filing Fairy tried to come to terms with some new forms that had appeared to have been circulated without being ascribed a number - this is quite a sin! The Filing Fairy's husband and I met with representatives of Network Rail as we gently try and achieve the holy grail of total ownership of our estate. This exercise was quite positive and there was a will to resolve all outstanding matters. However, this will not be a quick process but the overall impression was that all parties were keen to achieve a common goal.